President Trump's assault against the environment is so extreme that we're creating an emergency legal fund to stop him. Make your tax-deductible donation to the Stop Trump Legal Fund today! President Trump's assault against the environment is so extreme that we're creating our first-ever emergency legal fund to stop him. NRDC has already filed suit against the Trump Administration on dozens of fronts: to stop the Keystone XL tar sands pipeline... to defend our Arctic and Atlantic coastlines from drilling... to save bees, birds and butterflies from a flood of dangerous neonic pesticides approved by the EPA. And this is just the beginning. The barrage grows by the week. And we must respond with maximum legal force. 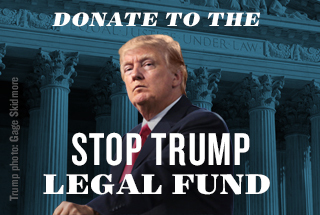 Make your tax-deductible donation to the Stop Trump Legal Fund today! Donations will go toward supporting NRDC's Litigation Team and will help NRDC mount a massive legal counterattack to stop President Trump's assault on our environment.